How does the opening of the play set the tone for what will follow? 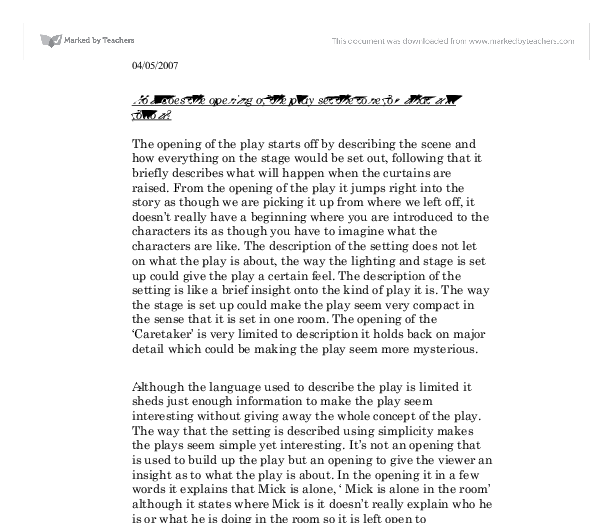 The opening of the play starts off by describing the scene and how everything on the stage would be set out, following that it briefly describes what will happen when the curtains are raised. From the opening of the play it jumps right into the story as though we are picking it up from where we left off, it doesn't really have a beginning where you are introduced to the characters its as though you have to imagine what the characters are like. 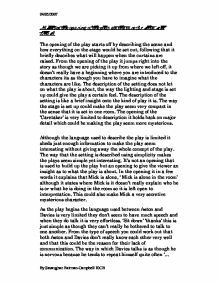 The description of the setting does not let on what the play is about, the way the lighting and stage is set up could give the play a certain feel. The description of the setting is like a brief insight onto the kind of play it is. ...read more. This could also make Mick a very secretive mysterious character. As the play begins the language used between Aston and Davies is very limited they don't seem to have much speech and when they do talk it is very effortless. 'Sit down' 'thanks' this is just simple as though they can't really be bothered to talk to one another. From the type of speech you could work out that both Aston and Davies don't really know each other very well and that this could be the reason for their lack of communication. The way in which Davies talks is as though he is nervous because he tends to repeat himself quite often '... haven't had a good sit down...had a proper sit down.' Also it could become clear to the audience that Aston and Davies do not really know each other ' That's kind of you mister'. ...read more. 'This your house, is it?' Davies is presented to the audience as a man who seems to have a negative attitude towards everything 'All the Blacks had it, Blacks, Greeks, Poles, the lot of them' this could also show that Davies is racist towards others. Davies is not afraid to speak his mind, however he doesn't really think about what he is saying he just comes out with it 'Them bastards...' when he talks he doesn't seem to care about what others may think about him. Whereas Aston seems as though he gives himself to himself. Although the opening does not let on what the play is about we as an audience learn quite a lot about the two characters. This opening is a perfect opening in may ways because it just sheds enough light about the play yet does not totally give the concept away, plus we learn quite a lot from the description about the characters. 04/05/2007 By Savaughan Fairman-Campbell 10CB ...read more.